As part of my series on making digital transfers of vinyl LP phono records, I recommended Sound Devices’ USBPre 2 (street price $895) as the most cost-effective (“Pareto Optimal”) USB combination analog-to-digital converter and monitor (headphones or loudspeakers) controller. In that usage, the USBPre 2 takes an analog output from a phono stage through its line-level RCA jacks and converts the analog signal to digital (at data densities up to 24 bits/192kHz), and outputs the digital datastream via USB cable to a host computer (which is also the source of the USBPre 2’s power). The linked-to blog post enumerates the USBPre 2’s many virtues, and makes a compelling case for its value for money. In addition to digitizing LPs, the USBPre 2 can be used for live recording. The USBPre 2 can provide 48V “phantom” power to professional microphones (but the 48V power can be switched off for pure-ribbon or dynamic microphones). Further, the USBPre 2’s metering and monitoring are truly professional-class. 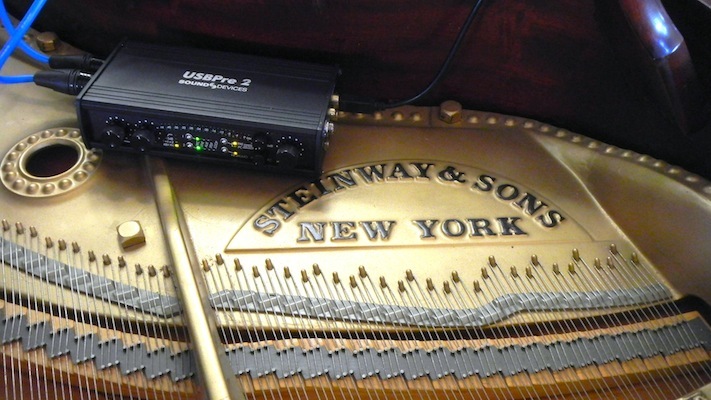 Given that the USBPre 2’s microphone preamplifiers are based on those of Sound Devices’ industry-standard 700 Series remote-location portable digital recorders, I wanted to make a location-live solo-piano recording. More details, and a sound sample, after the jump. Steve Martorella, Minister of Music of the First Baptist Church in America, volunteered to play a bit of Scarlatti (the K. 32 Aria in d). The piano was a well-maintained 1920s New York Steinway, and the microphones were Pearl (of Sweden) CC22 rectangular-diaphragm condenser microphones in the ORTF array. Today’s street price for a pair of Pearl CC22s is about $2200. ORTF is the initialism for the name of a French broadcasting network. 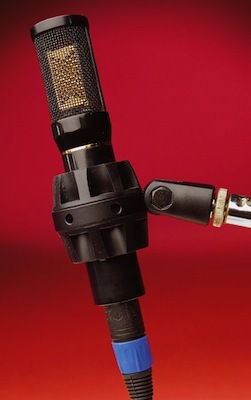 The microphone array positions two cardioid-pattern microphones, spaced about the distance between our eardrums [17 cm] and pointed out from center with an included angle of 110 degrees. The advantages of ORTF micing include a wider soundstage with realistic depth, the ability to mic from a greater distance and therefore with a more natural blend, ease of setup, and predictable and repeatable results. 1. Domenico Scarlatti: Aria (Sonata) in d, K. 32. While I recorded to an iMac using Amadeus Pro II, I am told by Sound Devices that with a powered USB hub and the right dock or adapter plug and cables, the Sound Devices USBPre 2 can record to an iPad, and perhaps to certain iPhones. But I did not try that. I can envision perhaps recording to an iPad—one of the larger ones—but I think an iPhone would feel rather cramped using a program such as Amadeus Pro II. Thanks to Steve Martorella and the First Baptist Church in America; and to Sound Devices, for the loan of the USBPre 2.